Warning: This article spoils Life is Strange which does include trigger warnings for suicide, parental abuse and sexual assault. 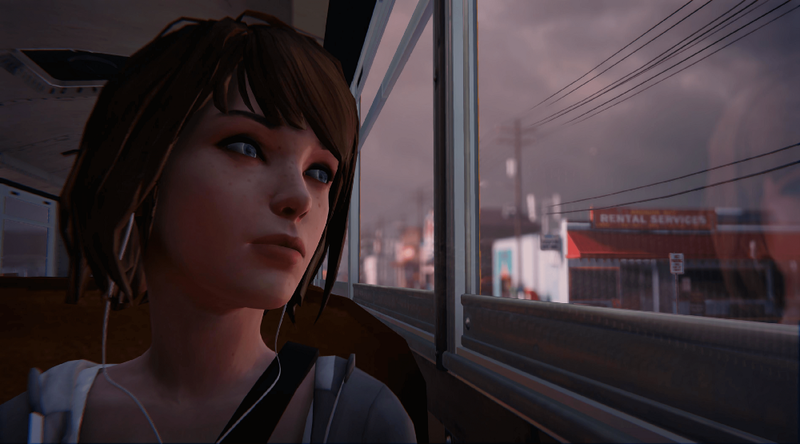 Looking at the entirety of Life is Strange you can see that it’s saying a lot. The entitlement of men plays a huge part in both villain’s backstories. Mr. Jefferson treats his drugging and abuse of his students as just picking from a selection his next model and he fully feels that they should feel happy to be chosen by him. Nathan Prescott seeks to control every one of his friends. Suicide and bullying are brought up constantly. Grief swirls around the town like the storm that Max dreams about. 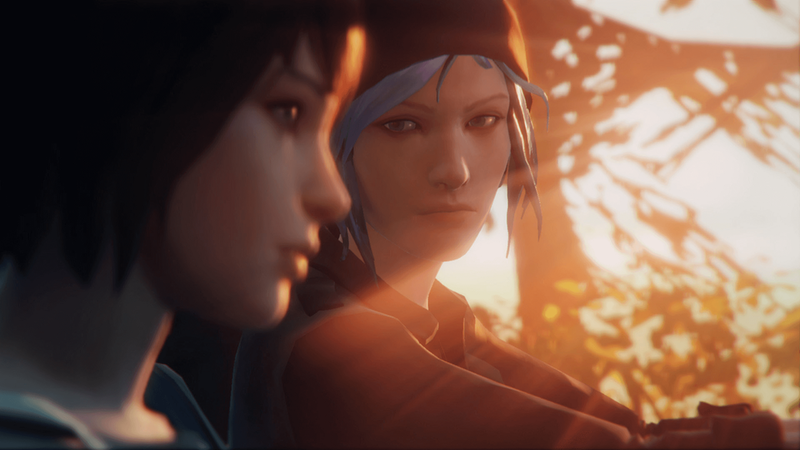 What Life is Strange seems to point to as it’s major theme for the majority of the game is having good relationships. Real relationships where you know and care for the person. This ranges from mildly friendly ones like Max’s various dorm mates to her old best friend and possible romantic interest Chloe. The latter is what drives Max as she experiments with her new found powers and goes on an adventure that changes both of their lives. The game is an adventure game where you solve puzzles and talk to characters. It styles itself after a hipster indie move with pencil drawings all over notebooks and an acoustic guitar always strumming. Little notifications pop up when you make an important decision and the hook is the ability to rewind to a point where you can pick another choice. You can immediately go back and see how the other choice plays out. Maybe the security guard who is harassing your friend Kate will take his anger out on you later if you step in, or maybe Kate will run off crying if she sees that you did nothing. It’s moments like these that make up the bulk of the game. The game and Max often wonder if she’s a good person for doing things like this, playing with time to see what suits her and her friends best. Get someone’s favorite movie wrong? Just rewind and get it right and they’ll be impressed. It’s not until those powers are taken away and the aforementioned Kate is about to commit suicide that Max has to come to terms with what type of person she is. Max and the player have to talk to Kate and prove that people do care for her. The scene is intense and powerful precisely because of how each of your choices led to this and influence it. If Max payed attention then she saves Kate, if she didn’t then Kate falls to her death as she watches. I saved Kate and I felt so good about it. The game hit hard as someone who had dealt with suicidal thoughts just months prior to the game’s release. This moment either proves that Max is at least trying to use her powers for good or it is the wake up call she desperately needs. Max then spends the next episodes trying to save Chloe from various things, ranging from a drug dealer out to get her to an abusive father. It’s over the entire game that you learn another thing that Life is Strange is about. Being Chloe Price is pain. Chloe Price lost her father five years before the start of the game. A few days later her best friend Max left for Seattle and never called or wrote again. After meeting a girl named Rachel that she falls in love with her life seems to be getting better until that is ripped from her too. Over the course of the game Chloe is abused by her father, learns Rachel may have been merely playing with her and then is shot dead while trying to protect Max. One alternate timeline leaves Chloe slowly dying after a car accident. We are treated with shots of Chloe’s dead body multiple times, usually as music plays and the camera focuses on it, with one of the last times leaving her laying on top of Rachel’s makeshift grave in a garbage dump. It’s actually Chloe’s death that book ends the game. Max sees her getting shot in a drug deal gone wrong (implied to be marijuana which is one of the more laughable elements of this game) and reaches out to save her not even recognizing her as her former best friend. It’s there where she finds her time powers and proves that she’ll stand up for people when the time comes regardless of who they are. However at the end of the game when Max travels back to that moment and instead hides and listens as her friend dies alone in the bathroom when the game reveals what it truly is about. Do you remember the storm I mentioned? That storm is a constant throughout all of Life is Strange. Max is awakened by a nightmare during class about the storm and ends up going to the bathroom Chloe will soon die in to freshen up. The storm becomes not just a force of nature but of time, a symbol of all the ways Max has changed things with her power, a punishment from an unseen god for interfering in the plan. A way to tell the player that no matter what, death comes for us all. 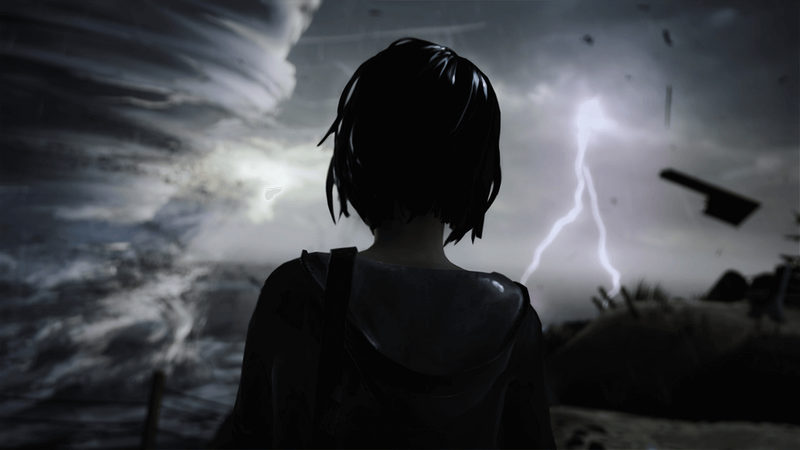 The game ends as the storm is heading towards the town where you and Chloe live. It will kill everyone when it hits. The only thing that will stop it is if Max goes all the way back to that bathroom that started this and never time travels again. (It’s never fully explained how or why they know this, especially because she had dreams of the storm before using any powers.) The player is given a choice, one that Chloe removes herself from: either let Chloe die or let the town die. Save Chloe and you see the town wiped out as they hold hands, then drive away. Save the town and you’re treated to a much longer scene that shows what happens to many of the characters you met. No matter what the point is clear: the result of you trying to help is just delaying the inevitable or death on a major scale. Games with heavy choice elements are notorious for these kinds of endings with the only choice that matters being right at the end. I understand why it happens and also the frustration with it, but Life is Strange does more then that with it’s ending. Not only does it make the prior choices and actions meaningless, it invalidates them completely and flies in the face of the morals the game had set up to that point. It doesn’t matter if you saved Kate or Chloe, they were just going to die eventually. The game isn’t even that concerned with Kate after her suicide attempt; her only other scene is Max grilling her for more information about her traumatic experience. Life is Strange may dress up like a darker Zack Braff or Wes Anderson film but its message lands firmly in Lars Von Trier. Not long after the game has you walk through a diner of all the friends you made asking you not to kill them you are treated with a final message wrapped in a twee ending song. That helping Chloe was wrong and you doing it was just delaying the inevitable and ultimately putting people at risk. Chloe had to die because she had to die. End of story, roll credits. As the years go on I often think back on Life is Strange. I think about the fan art and fan games that were made in the aftershock of the ending. I think about how the game released as I came out as a queer woman. Most of all I wonder why the game was so cruel. I’m not against tragic stories, but I want them to mean something. As time comes between me and Life is Strange I can only think of how this ending seemed to go against everything the game had set up prior. Even when another Max attacks you inside your mind it more is symbolizing Max’s self doubt then actually calling her out for using her powers in a way that is dangerous. The last shot of the ending where you save the town is Max watching as a butterfly flies off. The butterfly symbolizes not only “the butterfly effect” but also Chloe. There’s a feeling that now that she’s dead and buried that she might know some peace somewhere else. In a game that deals with suicide and puts prevention hotline numbers after every episode it feels like a slap in the face. It’s not just that you couldn’t help Chloe, it’s that the act of you helping caused more damage, that everything is better if you just sit there and do nothing. Max and Chloe only kiss when Chloe is about to die. When I bring up the fact that I hate the ending to this game many people think I’m mad at how it handled it’s queer romance. True, I could have written a whole other article about how it treats this romance only through a lens of tragedy. I could talk about how it then cynically cashed in on a prequel starring Chloe and Rachel in another story doomed for tragedy. I could talk about how their recent brush off of queer fans shows that they never really appreciated those fans. To say that is my only problem or even my biggest is not true. Life is Strange looks at a tragedy that your character is trying to fix and scolds them for ever trying. For not just letting things work themselves out, for letting Chloe fall apart when you can help her. It’s not a coincidence that when Max uses her powers she literally reaches out towards the person she is trying to help. Just like it’s not a coincidence how she finally solves all the problems in the game by sitting there silently and doing nothing because in the end that’s all you should do. The game acts like it’s saying that death comes for us all. In reality what it says is that we should not help the living and only mourn them when they are dead.